German SUV Audi Q7 V12 TDI Quattro the sample of 2013 is in full sense the car which it is possible to name Auto all inclusive (the car all inclusive). The second such representative in a car the world simply is not present. It is safely possible to name also our today’s visitor Audi Q7 V12 TDI Quattro 2012-2013 brightest representative of German design thought. Are ready for more details? We will consider advantages of the most “adult” representative of Audi, and of course one of the fastest: 6-litre engine V12 TDI came from motor racing, engine power of 500 HP, a twisting moment – up to 1000 Nanometers, acceleration to 100 km/h in 5,5 seconds, the maximum speed 250 km/h (limited by electronics), the sizes of a body at length more than 5 meters, an all-wheel drive Quattro, an adaptive pneumosuspender, the maximum ground clearance in 240 mm, seven-seater interior (can be six- and five-seater), extremely rich filling of the car by functions of comfort, entertainment and safety, refined materials of furnish of an interior, phenomenal roadability. Traditionally automobile reviews begin with the description of an exterior of tested model, from a photo of a picture and video, in rare instances, when the participant of the test is sport penalties focus attention on characteristics of the engine and speed indicators. In our case we begin with the engine which installation caused weight of changes in appearance of usual Audi Q 7. The reader can think — why from the engine? The answer is simple and banal — the motor fantastic, not only thanks to the kickback, but also fuel efficiency and reliability indicators. As we told above, the motor came from motor racing, it is the lineal heir of the engine of Audi R10 TDI established on a race car (the double winner in races «24 hours Le Mans»). The engine prepares manually at the enterprise of the company of Audi in the Hungarian city of Der. Hi-tech diesel engine V12 TDI with a camber of cylinders in 60 degrees is made from: Crankcase — pig-iron with graphite (GJV-450), a bent shaft — shod chrome- an alloy, connecting rods and buckets from aluminum, heads of the cylinder block from a high-strength aluminum alloy. Thanks to two systems of Common Rail under the pressure of 2000 bar is injected through spray jets with piezo elements. Thus the motor compact, length only 684 mm, and thanks to a mirror arrangement of six cylinders is ideally balanced and counterbalanced. The huge twisting moment is transferred to wheels through 6 step automatic transmission. It is necessary for potential owner to address very accurately with an accelerator pedal, by insignificant pressing gas it would seem heavy new Audi Q7 V12 TDI Quattro in weight 2605 kg amazes with temperament. It seems that the fallen lace from your boot causes instant reaction, sufficient for explosion in a motor compartment. High capacity needs to be had, it is necessary to realize motor potential competently. For this purpose to a German high-speed diesel off-road car expanded a track of front wheels to 1669 mm and rear to 1697 mm (at usual Audi Q7 1651 of mm and 1681 mm accordingly). Established wide wheels of 295/40 R20 (as an option wheels are accessible 295/35 R21), — for which even it was necessary on 26 mm in front and 30 mm behind to expand wheel arches. For more rational and correct receipt of air to radiators of intermediate cooling turbo compressor on a front aerodynamic panel there were the huge air intakes covered with beautiful grids. The basic air vent of a radiator enclosure — a firm trapeze of Audi with the rounded off corners. The front bumper besides additional air intakes received weight of aerodynamic elements and stylish tapes of light-emitting diodes of the day running fires consisting of 12 bulbs on each party of an aerodynamic panel. At any angle review of Audi Q7 V12 TDI Quattro looks impressively powerfully, it is sports and it is purposeful. The car is created for “consuming” of kilometers of a road cloth on in other words speed for many off-road cars far for 200 km/h. Well, what we sit down for a wheel and we estimate explosive character of the diesel monster? But a bit later, for now we are inspected. Getting to interior it is marked high-quality materials of furnish of the interior, the verified ergonomics and a German pedantry under the relation even to trifles. In interior it is simply pleasant to touch all, the convenient multifunctional steering wheel with under wheel pedals of change of drives caresses hands, ideal “handle” of the selector of an automatic transmission as if poured in settled down in embrace of a palm, the button, the handle, decorative inserts from carbon — a class! Front sports armchairs with an anatomic cross-section and the electric drive allow the driver needs are met well because all the “items” are arranged conveniently and comfortably. To speak about interior Q7 V12 TDI filling Quattro it is possible hours, there is everything that is available in stocks of the company from Ingolstadt and usually all is used together, unless as tuning there is just no limit for charging this beast. Adaptive cruise-control, Audi Lane Assist and Audi Side Assist, a rear-view camera and parktronic, separate climate control, multimedia system Bose Surround Sound System (CD-changer, Ipod, MMI Navigation plus, DVD-Bose, Bluetooth,) acoustics Bang and Olufsen Sound System with 14 points of a sound providing sound effect of a concert hall and an output power more of 1000 Vt, system Keyless-Entry (keyless access and a starting engine operation the button), leather furnish and many other, providing full sensation of comfort. The model can have three or two rows of seats, with seven passengers onboard tonnage of a baggage compartment makes 330 liters, in a five-seater configuration of interior — a luggage compartment of 775 liters, combining the second row besides an equal cargo platform in width of 122 cm we receive a volume compartment in 2035 liters. On any armchair of a place for a convenient arrangement — with an enviable stock and how can be on another in the car with such impressing sizes? At length more than 5 meters (5063 mm), at width — 2000 mm, in height — 1737 mm, the sizes of base — 3002 mm. 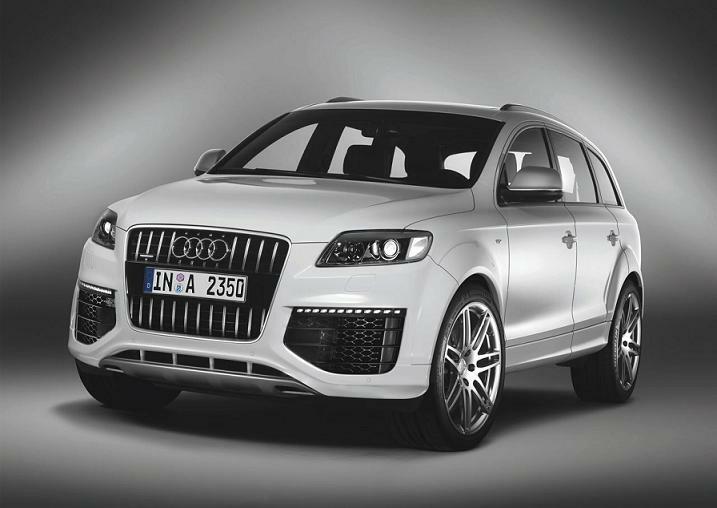 For judges of the fine there is version Q7 Audi exclusive concept, accessible and for Audi Q7 V12 TDI Quattro. With furnish of color white (alabaster white) and brown (chestnut brown) skin Feinnappa stylishly supplement an exclusive interior revetted with a black nut with inserts an oak of back parts of a back of armchairs and a baggage compartment floor, and also a luggage compartment are fitted in white — a skin alabaster white. About the engine it has been told much, we tell to pair of words about a suspender and brakes. A suspender on pneumoelements with function of constant monitoring and change of ruggedness of absorbers, and sizes of a road gleam, by means of MMI it is possible to choose one of variants of size of a ground clearance (automatic, comfort, dynamic or lift). Brake ceramic disks calculated on 300000 km of run, in front in diameter 420 mm (with 8 piston calipers), and behind diameter of 370 mm (with 4th piston). Well and, certainly, a constant all-wheel drive Quattro, capable to provide optimum distribution on twisting moment shafts. Let’s try all arsenal in operation. We press the starting engine operation button, the easy shiver passed on a body, we come into suspender options we choose a mode dynamic. We are fastened, we translate the automatic transmission selector in position Drive, we release a pedal of a brake and we press on an accelerator pedal — a kick behind, speedup stuns, we have not time to look at speedometer indications, heavy V12 as if the tank 100 … 150 … 200 … dynamics does not decrease 250 … – all indicators are worked correctly. Palms wet, on a back are flown down by a sweat stream, look in a mirror — sacredly happy eyes explain all. The super car, responses of owners say that it is possible to remove a speed limiter and then … 300 km/h really. Here is the video for you to check where this beast goes 1/4 mile and to 0-100-200 km/h speed.